Allies of the British during the American War of Independence, the Six Nations Iroquois received extensive lands along the Grand River in 1784. 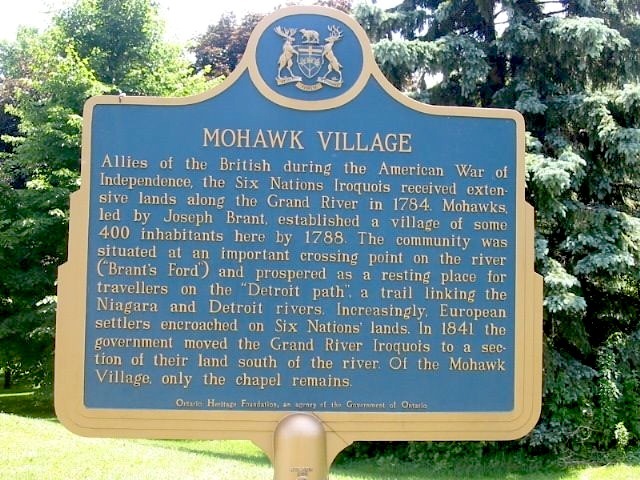 Mohawks, led by Joseph Brant, established a village of some 400 individuals here by 1788. The community was situated at an important crossing point on the river ("Brant's Ford") and prospered as a resting place for travellers on the "Detroit path", a trail linking the Niagara and Detroit Rivers. Increasingly European settlers encroached on Six Nations' lands. In 1841 the government moved the Grand River Iroquois to a section of their land south of the river. Of the Mohawk Village, only the chapel remains.